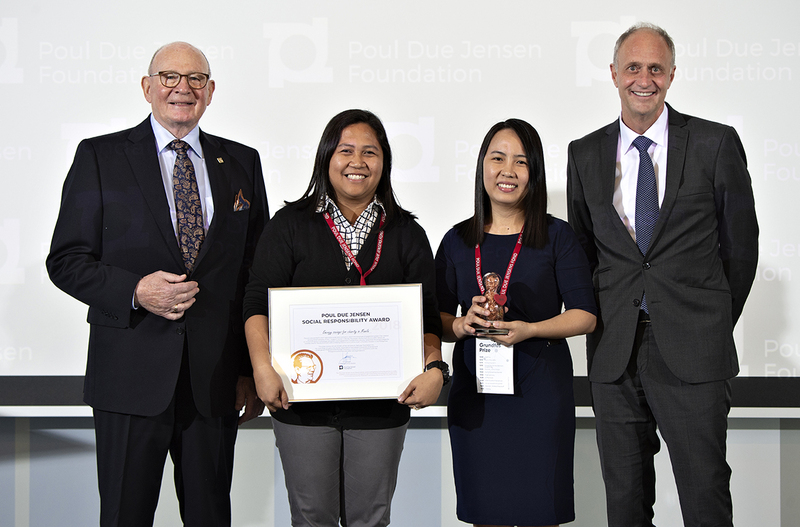 Grundfos Prize 2018 – Social Responsibility Award winners (Philippines). Photographer Lars Holm. Over the last years, the employees have worked hard to save energy and water. All the savings have been converted into donations to the Stairway foundation. Betcha (Maria Dolores) Austria and Maria Teresa Resuena from the support centre received the award on behalf of their colleagues at the Grundfos Prize Ceremony. The Award consists of a diploma and a statuette for the office. Along with the honour comes also a donation from the Foundation of EUR 20,000 which will go directly to the NGO Stairway Foundation which helps to protect and to dignify the most marginalized and endangered children living on the streets and in extreme slum.